If you’re in West Michigan on Monday, plan to come to Grand Rapids Theological Seminary for our annual Talking Points conference. This year’s theme is Christian Civic Engagement: Right, Responsibility, Opportunity. Dr. Amy Black of Wheaton College and Dr. George Marsden of Notre Dame are speaking, and I’m giving a presentation on Paul’s political vision. It’s shaping up to be a great day of lively discussion, so plan to attend! N.B. : I’m going to avoid dressing so as to favor either liberal (corduroy jacket, knit tie, frayed khakis) or conservative (blue blazer, red tie, pressed khakis) folks, so I’m considering speaking in this outfit. Will this be available online somewhere after the fact? Wish I could be there! I’ll probably post my presentation here on the blog, but I’m not sure if the others will be available in audio format or otherwise. Check the web-site afterward, I’d say. Haven’t heard of it, Joey. And I just wonder, can anything good come out of . . . Utah!? 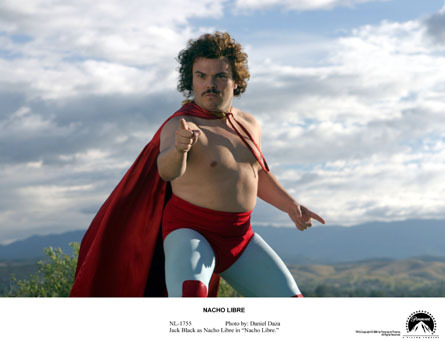 This outfit is only acceptable if you quote Nacho during your presentation. Haha! Looking forward to it-I’ll be there! Cool, Marco, should be fun!